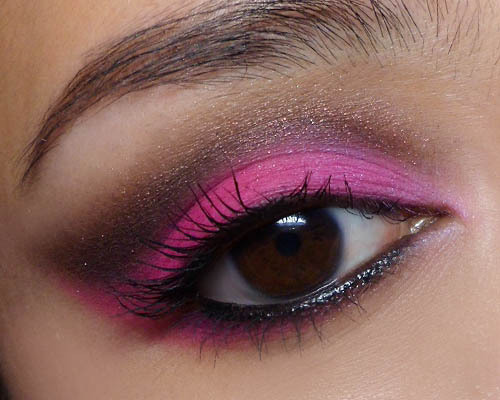 This is a very dramatic look pairing hot pink with a smoky dark russet brown. Definitely more for the clubs or a party than a day out with the girls! Step 1: First run a black khol along your upper and lower water lines. Step 2: Using a pointed brush for control, first draw a line diagonally up and out at the outer corner of the eyes. Then pick up more shadow and run it along the socket line, stopping before you reach the inner corners. Smoke the entire line out to get a really thick brown swatch. Step 3: Pack a neon hot pink along the entire lid, leaving only the inner corners empty. Then run the pink along the outer halves of the lower lash line as well, extending the line up and out, right under the dark brown wing created earlier (below). 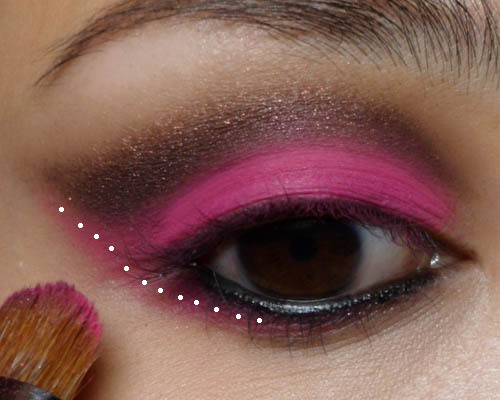 Step 4: To illuminate the eyes a little, apply a paler mauve pink to the inner corners of the lid. Then finish by curling lashes and applying black mascara.